A new year always looks so bright and full of hopeful expectation in the beginning. We plot and plan the next blank 365 days, write our resolutions and lists in big, bold letters across crisp pages, setting goals like “drink more water” and “save for travel”. January can feel like a hummingbird month. Constantly flapping our wings and buzzing from one source of nourishment to the next; so focused on doing. Gyms are full to capacity. Every email blast, diet program, website update, blog post, Pinterest suggested pins, Instagram motivation, and sermon for the next few weeks will be about how to be a better YOU this year. And if you aren’t following these “5 Steps to Your Most Successful Year EVER”, then you’re falling behind. But God doesn’t call us to be hummingbirds. He calls us to be eagles. I had a conversation recently with someone in full-time ministry who lamented about the stress of January. And it really made me pause. If working for God causes stress and anxiety, if our path to a more confident and peaceful self is riddled with fear and striving, and if we are so focused on keeping up with the Joneses that we forget Who our lives belong to…then we are missing the entire point. Eagles remain steady. 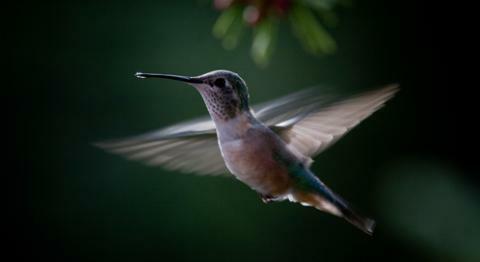 They don’t work spazzily like the hummingbird- darting here and there, a million miles per hour. They spread their wings and trust the wind stream. They are confident in their purpose. They don’t strive. They soar. So my challenge to you (and to myself!) is this: let’s spend 2017 living more like eagles than hummingbirds. Let’s refuse to give in to the unattainable standards of the “best year ever”, and instead trust that we can spread our wings and allow God to carry us through the inevitable ups and downs that come with life. Look forward in hope and expectation. But slow down and give yourself breathing room to stretch and grow. Grant yourself some grace when things aren’t picture-perfect. And let God take you places you haven’t even dreamed of yet.